By Various. Guitar Recorded Version. Rock and Pop. 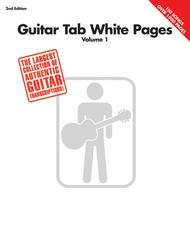 Guitar tablature songbook (softcover). With guitar tablature, standard guitar notation, vocal melody, lyrics, chord names, guitar chord diagrams and guitar notation legend. 1024 pages. Published by Hal Leonard (HL.690471). If you're about to be stranded on a desert island and you can only take your guitar and one songbook with you, make sure it's The Guitar Tab White Pages! This incredible second edition contains 150 note-for-note transcriptions straight from the original recordings – over 1,000 pages of guitar tab! The primo songlist covers some of the best guitar songs ever from all styles of music. Songs include: All Day and All of the Night • American Woman • Change the World • Cliffs of Dover • Couldn't Stand the Weather • Dani California • Don't Fear the Reaper • Dust in the Wind • Free Ride • Gloria • Heartache Tonight • Hey Joe • Layla • Longer • Moonlight in Vermont • Mr. Jones • Name • Owner of a Lonely Heart • Papa's Got a Brand New Bag • Piece of My Heart • Rhiannon • Satin Doll • Sir Duke • The Space Between • Sunday Bloody Sunday • Sweet Child O' Mine • Time for Me to Fly • What I Like About You • You Give Love a Bad Name • You Were Meant for Me • and more! The largest collection ever of authentic guitar transcriptions! Guitar Recorded Versions are note-for-note transcriptions of guitar music taken directly off recordings. This series, one of the most popular in print today, features some of the greatest guitar players and groups from blues, rock, and heavy metal. Guitar Recorded Versions are transcribed by the best transcribers in the business. Every book contains notes and tablature. September 07, 2009 Simply awesome! 55 of 104 people found this review helpful. 60 of 99 people found this review helpful. July 06, 2008 ITS AWWWWSOME!!!!! This book was so helpful i play out of it all the time its pretty hard but you just have to practice it and dont get mad. 55 of 91 people found this review helpful. 54 of 94 people found this review helpful. 51 of 87 people found this review helpful.